Since the 1920s, many crops have been grown from hybrid seeds created by crossing two varieties. These hybrids can have superior qualities in areas such as yield or pest resistance. But the seeds of hybrid crops do not produce plants with the same qualities. The ability to produce a clone, an exact replica, of a plant from its seeds would be a major breakthrough for world agriculture. Instead of purchasing expensive hybrid seeds each year, which is often beyond the means of farmers in developing countries, farmers could replant seeds from their own hybrid plants and derive the benefits of high yields year after year. About 400 species of wild plants can produce viable seeds without fertilization. Called apomixis, this process seems to have evolved many times in plants — but not in commercial crop species. The discovery by postdoctoral researcher Imtiyaz Khanday and Venkatesan Sundaresan, professor of plant biology and plant sciences at UC Davis, and colleagues at UC Davis, the Iowa State University and INRA, France, is a major step forward. “It’s a very desirable goal that could change agriculture,” Sundaresan said. 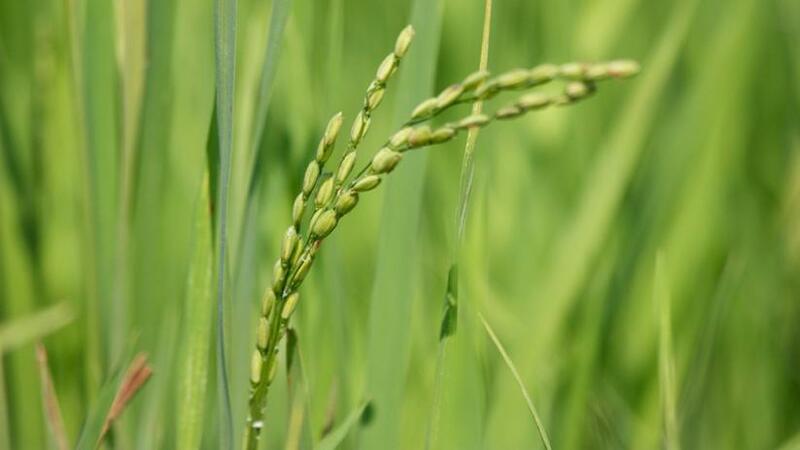 Khanday and Sundaresan discovered that the rice gene BBM1, belonging to a family of plant genes called “Baby Boom” or BBM, is expressed in sperm cells but not in eggs. After fertilization, BBM1 is expressed in the fertilized cell but — at least initially — this expression comes from the male contribution to the genome. BBM1, they reasoned, switches on the ability of a fertilized egg to form an embryo. The researchers first used gene editing to prevent the plants from going through meiosis, a type of cell division that results in four daughter cells each with half the number of chromosomes of the parent cell. Instead, the egg cells form by mitosis, inheriting a full set of chromosomes from the mother. Then they caused these egg cells to express BBM1, which they would not normally do without fertilization. “So we have a diploid egg cell with the ability to make an embryo, and that grows into a clonal seed,” Sundaresan said. So far, the process has an efficiency of about 30 percent, but the researchers hope that can be increased with more research. The approach should work in other cereal crops, which have equivalent BBM1 genes, and in other crop plants as well, Sundaresan said. Other authors on the paper are Debra Skinner at UC Davis, Bing Yang at Iowa State University, and Raphael Mercier, INRA, Versailles, France. The work has been funded by the Innovative Genome Institute, a joint venture between UC Berkeley and UC San Francisco that focuses on applying genome editing to solve global problems, and by the National Science Foundation. Your Post “Research develops rice plants that reproduce as clones from seed” is really Nice. I love reading Posts on health food…Thanks.